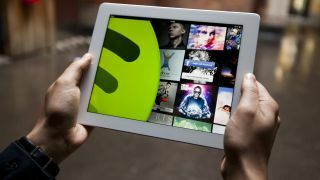 Music streaming powerhouse Spotify may be making a move into the video world. The Wall Street Journal reports Spotify "has been reaching out to companies that specialize in making content for YouTube." It's possible that Spotify is attempting to outdo its pricier competitor, Tidal, which offers music videos and will eventually stream live events. According to the report, Spotify has been in talks with companies that create content for YouTube about acquiring existing material and possibly joining forces to test the waters of original video content. The specifics of Spotify's new venture into video could be divulged as early as this month. The WSJ reported last month that Spotify's worth is about to rise to $8.4 billion, making it a stronghold in the streaming industry. The addition of video, and possibly taking pointers from Google's Music Key and Tidal looks like it could help strengthen the company's foothold as the top-dog.